The world record for furthest protruding eyeballs is 12mm, held by Chicago woman Kim Goodman. Since 2007 she’s been the undisputed champ of eyeball bulging but on this rainy October day in Ingolstadt, Germany, I’m pretty sure I could blow her into the weeds. I’m nervously inserted into the passenger seat of Audi’s A3 Clubsport Quattro Concept. It’s raining so hard it feels like we should be boarding an ark, not blasting around Audi’s corporate 3.2km racetrack. And as a hairpin hurtles at me through the windscreen, and bits of handmade, concept car Jesus handle ooze through between my clenched fingers, I wonder why I got into a car with an engineer whose name I don’t even know. It’s fine, as it turns out, he’s only trying to tear a hole in the fabric of spacetime with me next to him, my eyes bulging from their sockets like barely-tethered ping pong balls, causing me to look like a caucasian Kermit the Frog. Now that it’s my turn to drive, drunk on the melatonin tonic of jetlag, I’ve never been more relieved and yet terrified. You see, this is a priceless one-off concept car with 386kW and I’m about to punt it around a drenched racetrack. Audi built the A3 Clubsport for the Wörthersee Festival back in May and if you’re unfamiliar with this event, picture Oktoberfest but replace the girls in lederhosen with blokes in polo shirts. And swap the beer with red cordial. Clearly Audi’s RS engineers have been chugging the stuff. The Clubsport Quattro Concept is an A3 sedan dunked in a vat of bubbling lunacy. Pumped guards hide 21 x 9.5-inch wheels all round, with 275/25 rubber, themselves orbiting massive 370mm carbon ceramic discs. But unlike most concept cars, it’s not just the designers who’ve had a go. Audi’s let the engineers at it, too. 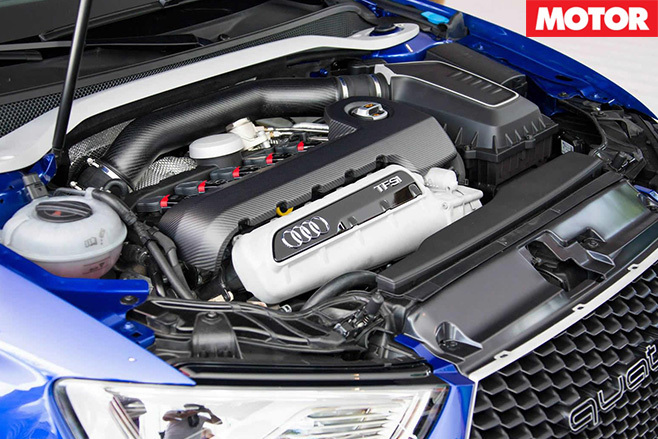 They’ve taken the 2.5-litre inline-five from the TT RS and extracted 386kW and 600Nm using a bigger turbo, intercooler and, yep, more boost – 22psi of the stuff. Meanwhile Audi’s replaced the carbs in the MQB platform-based concept’s diet with carbonfibre, the end result 1527kg. 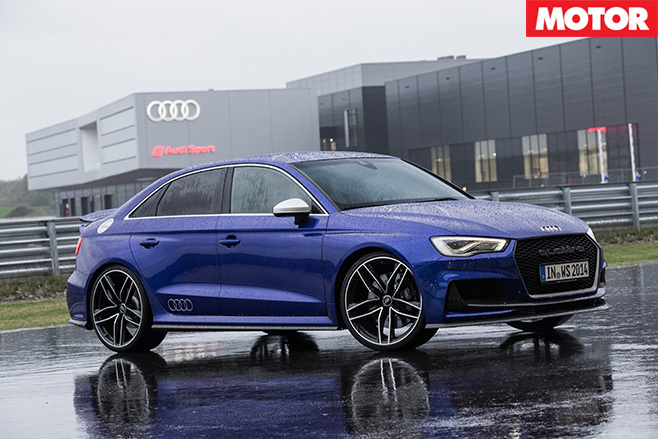 Which gives the A3 Clubsport Quattro concept a power-to-weight of 253kW a tonne. Or more than an R8 V10 Plus. As I rumble out of pitlane I’m also wishing the thing had a snorkel. It’s raining like the world’s oceans have colluded to invade the lands. My inner monologue is simply: don’t crash the thing, don’t crash the thing. She’s a one-off concept car, after all. But as I’m representing you lot, I give her full jandal out of pitlane and swear like electrified alligator clips are stunning my reproductive organs. The A3 Clubsport summons its quattro system and squirms intimidatingly as it puts that awesome stomp through four relative postage stamps of rubber. Yet, aside from a sniff of all-wheelspin, even in these conditions traction ain’t a drama. She’s fast. Full throttle, the turbos are snoozing until 2300rpm when suddenly the gods of acceleration hurl you towards horizon. First gear pins you to the seat. As you tickle 6900rpm the entire tacho turns tomato red like it’s forgotten to wear pants in public. It’s your signal to pluck shift paddle and as you do, there’s a crisp, brief rumble as the S-Tronic slots Next Cog, all the while the thing seamlessly slingshots itself forward under your tremblingly-pinned right clog. 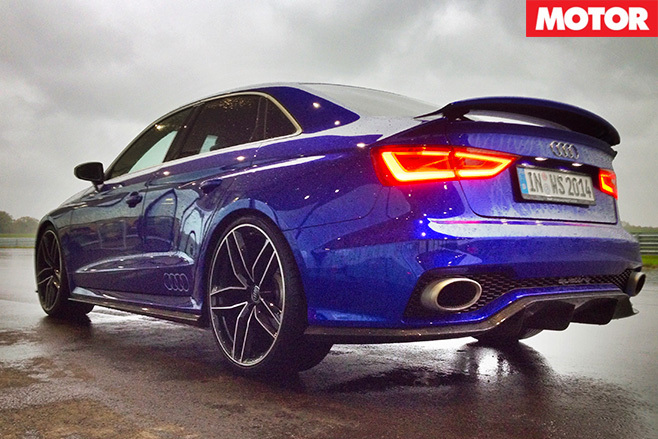 I don’t doubt the A3 Clubsport will hit 100 clicks in Audi’s claimed 3.6 seconds, or wind its way to 310km/h. The sound is like a half-strength R8 V10 (funny that), a unique five-cylinder thrum that tickles the cochlea like a Chilli Coca-Cola macaroon hits the tongue: a bit odd at first but different. Good different. As a drenched hairpin approaches, I hit the brakes at normal pressure, but am surprised to feel my sternum bend around the seat belt. The pedal’s short in travel but not on bite or aggro. Put an apex in the crosshairs and you’d be damned finding steering more eager if it was wearing a blue UNICEF polo shirt and haranguing people out the front of your local train station. There’s not much feel but the rack is quick almost like it’s 1.5 turns lock-to-lock. If you kamikaze your corner entry you’ll understeer politely. Summon the throttle greedily and you can even squirm the thing sideways under power. Expect to cackle maniacally. In a long, slow corner, under the auspices of torque vectoring the electronics will nibble at the inside wheels to keep the nose tucked in, too. There’s even an airbrake. 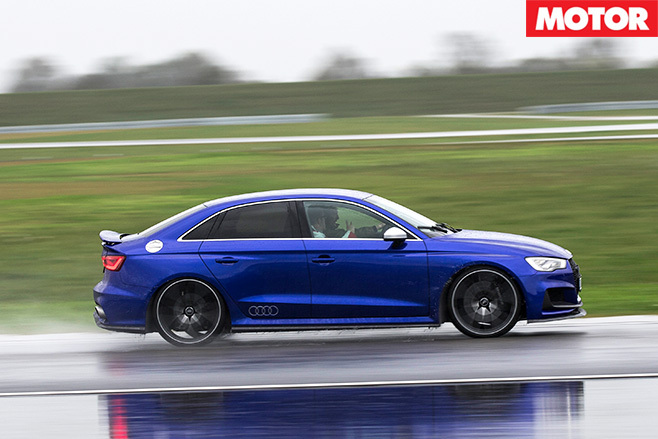 Not that we got to try it, but nail that terrifyingly sensitive brake pedal at 250km/h and the A3 Clubsport will sprout a large vertical spoiler off the bootlid to reduce stopping distances by around 12 metres. What a relief to know as you sail past those children playing on the autobahn. And while its speed is startling, the whole experience and the way it seduces the driver is still familiar Audi RS. Audi quattro GmbH boss Heinz Hollerweger is lobbying Audi’s corporate commanders to build the thing with RS3 badges. It’ll obviously be a little better behaved but still, Kim Goodman, you should be worried.